Mr. Andrew Alli, President/CEO, Africa Finance Corporation (AFC), says Nigeria needs as much as $3 trillion over the next 30 years to plug the nation’s infrastructure gap and achieve rapid sustainable development. Alli said at the 2017 FICAN Conference in Lagos that while the government must be a primary source of funding, federal and state governments’ fiscal inflows are grossly inadequate to match the pace of investments required in infrastructure. Extracts from the Nigeria Economic Recovery & Growth Plan 2017-2020 show that the Federal Government’s medium-term fiscal framework forecasts deficits of N7.6 trillion from 2017 to 2019”. This he said, is evidence that the Federal Government resources are limited and additional resources will be needed. Specifically, the power sector according to him, recently privatized, is still significantly government driven with challenges of Transmission, Gas supply, tariffs, payment Security, and operational limits which has left the industry in critical state regarding suitability for long-term investment. The overall effect of this according to the AFC boss is that Nigeria still struggles to provide adequate supply of reliable power to its population of approximately 170 million people, as generation capacity was still about 3038 megawatts at March, 2017. He believes that the country should generate 5000 megawatts by 2018. From Left; Mr. Michael Larbie, CEO, Rand Merchant Bank Nigeria Limited; Mr. Babajide Komolafe, Chairman, FICAN; Mr. Fola Fagbule, Head of Advisory, Africa Finance Corporation; Engr. 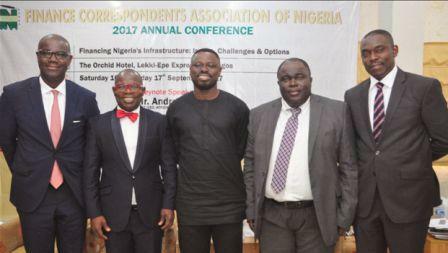 Chidi Izuwa, Ag.Director General, Infrastructure Concession Regulatory Commission and Mr. Ladi Sanni, Group CEO, Viathan Engineering Limited at the 2017 Finance Correspondents Association of Nigeria[FICAN] Annual Conference with the Theme: Financing Nigeria’s Infrastructure: Issues, Challenges & Options held in Lagos. “If we don’t have a cost reflective tariff, we will not have the kind of investment we want,” he stressed. Arguing that money is not the problem of infrastructure financing, Alli said other challenges that needs to be addressed include: bad Procurement processes, structural problems that make it difficult for investors to get value for money, funding structure, maintenance, tolling, among others. He also, frowns at inadequate attention which Nigeria pays to meeting the needs of specific investors and projects already in progress, or on creating policy incentives that will spur investments. “Even though the Country has proven gas reserves greater than oil reserves and world class deposits of tin, substantial iron ore and coal resources, unfavorable policies around pricing and access to acreage have limited infrastructure investment and development for several decades in Nigeria,” said the AFC boss. In proffering solution to poor infrastructure financing, the AFC president said there should be major overhaul in approach, for large ticket billion-dollar projects to work. “We need to reduce significantly, the level of opaqueness in public procurement. We must establish the framework for private contractors to borrow against a contract. 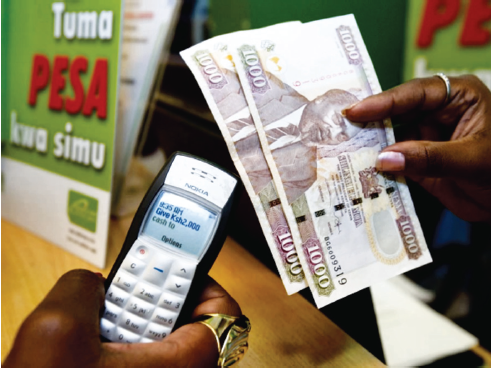 Ministries must spend more time developing contract that private capital can relate with. On natural resource, he said, significant amount of acreage are in the hands of those who have no real interest. 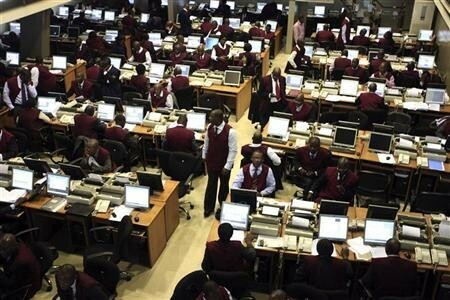 “Everyone involved in the privatization exercise has some blame to carry. We need to achieve a reset of the privatization programme. We are not seeing an empowered regulator that can enforce what is agreed. Enforcement will be painful on both sides, but that pain is necessary,” Alli stated. Referring to the electricity sector, he said strict enforcement of all agreement by all parties to a contract is important. He however commended Federal Government for decentralisation of the Nigerian ports via private sector concessions, which he said has allowed for planning and developing of port infrastructure and facilitation of financing for new construction through build-operate-transfer arrangement. Road transport which accounts for about 80 per cent of good traffic in Nigeria is the predominant mode of transportation, yet only about 20 per cent of the road network in the country is paved. In the same vein, Alli said despite significant demand for rail transportation, traffic volumes have collapsed to almost zero due to lack of maintenance and capital expansion. AFC is a US$3.4bn (total assets) multilateral development finance institution founded in 2007, with African public and private sector investors. It is established by an agreement between independent sovereign states. AFC has diplomatic status in its member countries and is one of the highest rated financial institutions in Africa, an investment grade international credit rating of A3/P2 from Moody’s Investor Services.